In this post we will look at the C++11 auto keyword. What it is? and how to use the ‘auto keyword’ in our program will be discussed. In any program if we need a value we would declare the type and a variable and assign a value to it or not. But to declare a variable we need to know the specific type of the value that we require. This is not a problem until we know the type of the data we need. However, sometimes it is not possible to determine exactly the specific type of the value the program may require. In such case, we can use the keyword auto.By using auto data we are forcing the compiler to figure out the type of the variable from the initializer. A simple code using ‘auto’ is shown below. In the program above we have not declare the type of ‘ii’ and ‘i’ variable but instead we gave the type as ‘auto’.And since the initializer of ‘ii’ and ‘i’ are integer literals the compiler deduce the type of ‘ii’ and ‘i’ as int type. Note here we did not write the type of ‘ii’ and ‘i’ as int type explicitly but the compiler deduced it from the value assigned to them -90 and 0 respectively-for us. Like wise if the value assigned to ‘auto’ variable is a real number -number with fractional value- the compiler deduce it as double type, it is not deduced as float type. In case if we assign a variable whose type we already know to auto variable, then the type deduce is same as the type of the initializer variable . You can check the type of the auto variable by using using typeid() operator but do not forget to include <typeinfo> header’s name. auto str=”string” , ii=90 ;   //error! auto val=34 , ff=90.447; //error! In code::blocks for the second line(line 3) and third line(line 7) you will get an error message as “inconsistent deduction for ‘auto’: ‘const char*’ and then ‘int’ “. **i):The auto variable is deduce as constant only when the initializer are constant reference or constant pointer.This means whether the initializer is const or not,if it is not a pointer the auto variable will be deduced as non-constant type.Consider the code below. In the fourth line(Code line 8) the initializer is an integer literal not a pointer, so ai2 is deduced as int type not ‘const int’ type or const int* type. In the fifth line (code line 10),ai3 and ip1 is deduce as const int*.We know that the only type to which a reference can be assigned as an initializer is a pointer. And since the initializer of both the variable: ci and ip, is a const type the type deduce is ‘const int*’. **ii): The auto reference and pointers will be interpreted as const only when they are assigned to a constant object. Here it means if the auto variable has a ‘&’ sign or ‘*’ sign in front, then they will be deduced as const reference or const pointer type only when the initializer is a const type.Consider the code below. auto &k=i , *g=&ci ;   //Error!! The code above shows only how to make a reference or a pointer const. Suppose if we want to make auto variable a constant type when initialized with constant variable then we can do so by mentioning the keyword const before the auto keyword explicitly. Here the const qualifier is mentioned explicitly so the type of ‘ii’ deduced is ‘cont int’ type. If you have not enable C++11 in Code::blocks then you may get an error while compiling your program which include C++11 features.You can follow the steps below to enable C++11 features in Code::blocks. 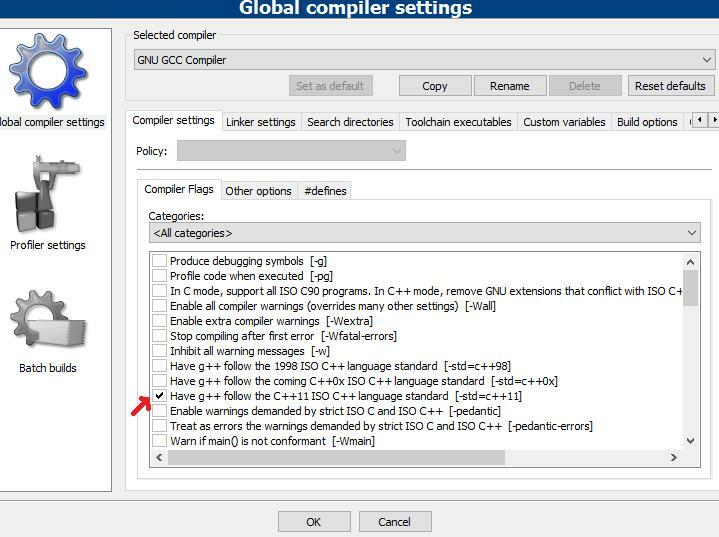 Go to Settings->Compiler and you will see a new Window whose name is “Global compiler settings” .The screen shot is given below. And check the box which says “Have g++ follow the C++11 ISO C++ language standard [-std=C++11] ” and click ok.
After this is done you will be able to use auto , decltype() and many more features of C++11.